Back in September 2013 (click here), I wrote about the preparations companies were making for new European labelling aka Food Information for Consumers Regulation No. 1169/2011. It finally comes into force this weekend (13 December 2014). These new regulations affect the way allergens are labelled on pre-packaged and loose foods. When I first heard about the changes I was initially critical. I think my reaction was understandable. I have been reading labels in a certain way since the day I left home (long time ago!) and here I am now having to re-learn my ways. Of course as with most things you slowly adjust and I have become familiar with recognising new labelling. Whilst I still think there are issues which need ironing out, on the whole I can see the reasoning behind the new rules. I still think that some brands need to work on how they highlight the allergens as there are occasions when the font colour or style just isn't clear enough for me. What puzzles me is why chefs/cooks (and sandwich makers) seem to be struggling with the concept. Why is it so difficult for them to be knowledgeable about the ingredients of the meals they are making? Is it really that difficult to breakdown the allergens in a ham, cheese and pickle sandwich? There is no need for posh labelling machines, just a requirement to know if a sandwich contains one or more of the 14 allergens*. The advice from the FSA is "... information on any of the 14 allergens used as ingredients will need to be provided for foods sold without packaging or wrapped on site. This information could be written down on a chalk board or chart, or provided orally by a member of staff. 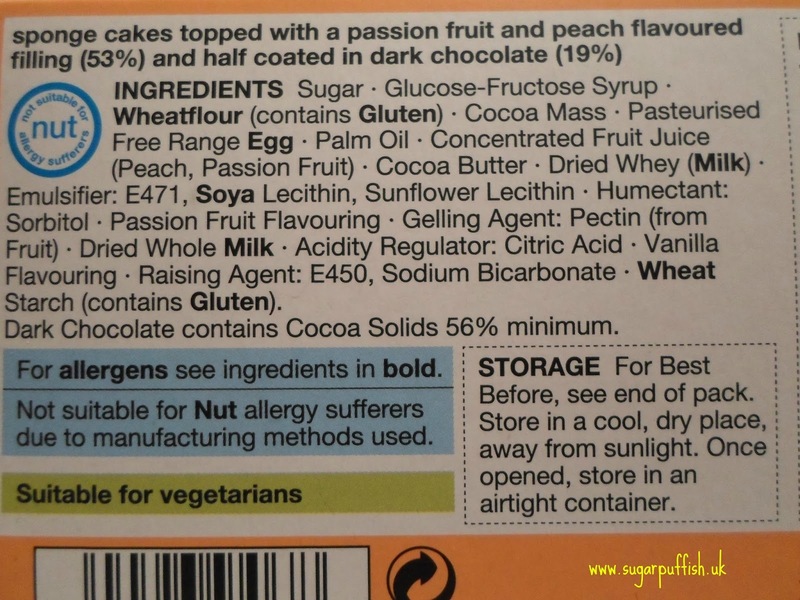 Where the specific allergen information is not provided upfront, clear signposting to where this information could be obtained must be provided." As for the concern that the new regulations are penalising those who don't have allergies I am lost for words. Seriously, I don't get it, would someone like to explain how this is affecting non-allergy folks? I'm guessing most won't even notice the new changes as they go about their daily lives. I bang my head against the wall with some attitudes. I hope this is just a small portion of the population who appear to have no common sense. Saying that, these are probably the same people who make a fuss about it being their human right to eat peanuts on a flight. As far as I'm concerned, from Saturday I am hoping to sit down in a cafe or visit a deli counter and have confidence in ordering food. No longer will wait staff be able to say they don't know the allergens and can't advise me. If you can't cater for me, I have no issue with that, there are a number of places that are capable of accommodating my dietary requirements. For the businesses that see this as an expense, I would ask them to see this as an investment for the future. Think of the number of new customers you are about to receive. People with allergies/intolerance/coeliac disease are a supportive group who rely on one another for recommendations of safe places to eat. I am confident you will be rewarded with loyal customers who will shout about you from the roof tops. If you would like to help promote awareness about the new allergen information, join the FSA's (Food Standards Agency) Thunderclap campaign. Great post Sarah. Working in a cake shop means we have to label the allergens in our food which is pretty much everything considering we bake cakes haha! But it's not hard!!! We're not going to label every single product, we're just going to have it available should anyone ask because we pretty much don't cater for most allergies (we can't do gluten free as we don't have a separate area) but we do make egg free sponges. It would be a waste and a lot of time to label every single thing but that woman complaining needs to get a grip! It just needs to be available should anyone ask! Some people ey!